The Murderess is a heart-stopping story of family, love, passion and betrayal set against the backdrop of war-ravaged Britain. Perfect for fans of Lesley Pearse and Dilly Court. 1931: Fifteen-year-old Kate witnesses her mother Millicent push a stranger from a station platform into the path of an oncoming train. There was no warning, seemingly no reason, and absolutely no remorse. 1940: Exactly nine years later, Kate returns to the station and notices a tramp laying flowers on the exact spot that the murder was committed; the identity of the victim, still remains unknown. With a country torn apart by war and her family estate and name in tatters, Kate has nothing to lose as she attempts to uncover family secrets that date back to the Great War and solve a mystery that blights her family name. 'Engrossing, un-put-downable and heartwrenching!' Faith Hogan. A haunting tale of love and betrayal … wonderful! Young Kate is horrified to think her mother, Millicent, pushed a woman into the path of an oncoming train. But she witnessed it with her own eyes - but could it have been an accident? As the years pass she tries to unravel the web of lies and the secrets that have been kept hidden for too long. Cleverly woven together, this story will keep you wondering until the very end. A poignant tale that will keep you turning those pages and an excellent read of love and betrayal during hard times. I found thing book hard to get into and it wandered. I hated the ending. 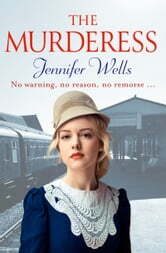 The Murderess is a new novel by historical author Jennifer Wells. The story begins in Missensham in 1931. Kate is being sent away to boarding school by her mother, Millicent Bewsey. It was a last minute decision by Millicent. They are on the train platform, and Kate notices her mum talking to another lady. The next moment Millicent shoves the woman onto the tracks in front of inbound train. Millicent then refuses to say one word. Nine years have passed since that day and Kate’s life has changed considerably (for the worse). Kate happens to be at the train station on the anniversary of the incident and notices a disheveled man leaving behind red peonies on the exact spot where Millicent committed her crime. Kate gets a closer look and there is a card attached that reads “For Rosalie”. Who is Rosalie? Is that the name of the victim? After all these years, the woman’s identity is still a mystery. The man looks like the one that attacked her mother in their walled garden about a fortnight before the terrible train incident. Kate’s father, Arthur receives a letter stating Millicent is up for parole and he wants Kate to write a statement to the parole board. This starts Kate on a quest to get answers. She starts reviewing the details of the case and delving into her mother’s past. What secrets will Kate uncover? Join Kate on her search for the truth in The Murderess. The Murderess contains good writing and a steady pace in the first half of the book. I thought the second part of the story dragged (it needed a faster pace). The story is told from Kate’s (1940) and Millicent’s (1915) perspective. It alternates between them. I thought the characters were bland, and Kate was unlikeable. The main problem with The Murderess is that it was predictable. Early on I was able to accurately predict how the rest of the novel would play out. The ending, though, may surprise many readers. The Murderess is an interesting story, but it needed a more complicated mystery along with a compelling main character. I give The Murderess 3 out of 5 stars. Stupid plot, horrible ending. Don’t waste your time. Really good, excellent characters and a twist at the end.